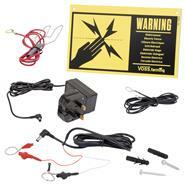 Complete Kit: Powerful 12V Energiser with Box, Anti-theft Protection, Fence Tester and Accessories! 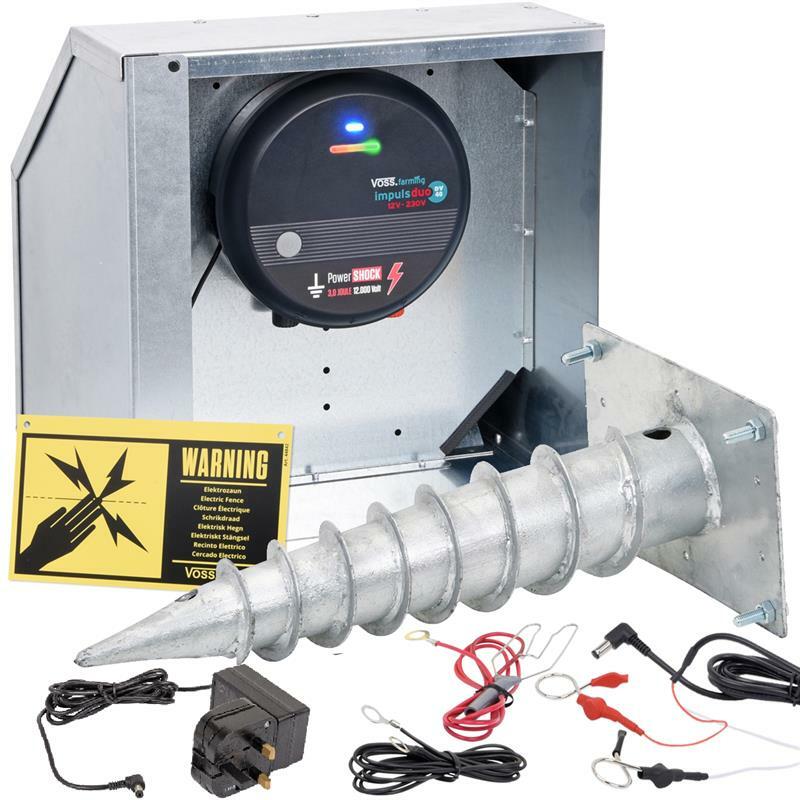 The kit includes the 12-volt energiser "impuls DUO DV40", a fence tester, a post, accessories for grounding and anti-theft protection. 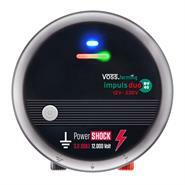 Why choose an electric fence energiser from VOSS.farming? 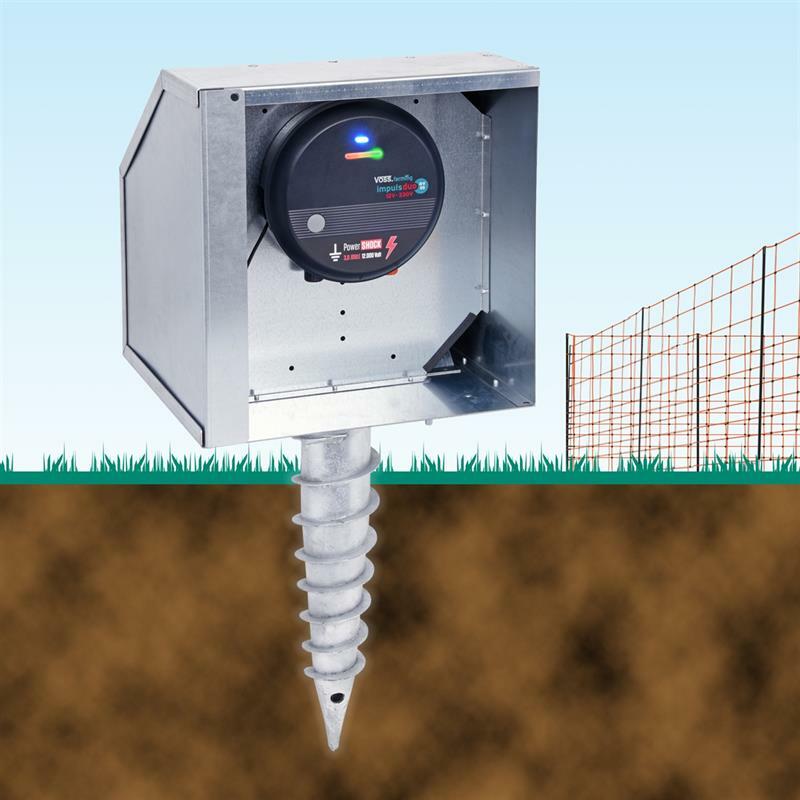 We have 35 years' experience in the electric fence business and know how important it is to use a reliable energiser. 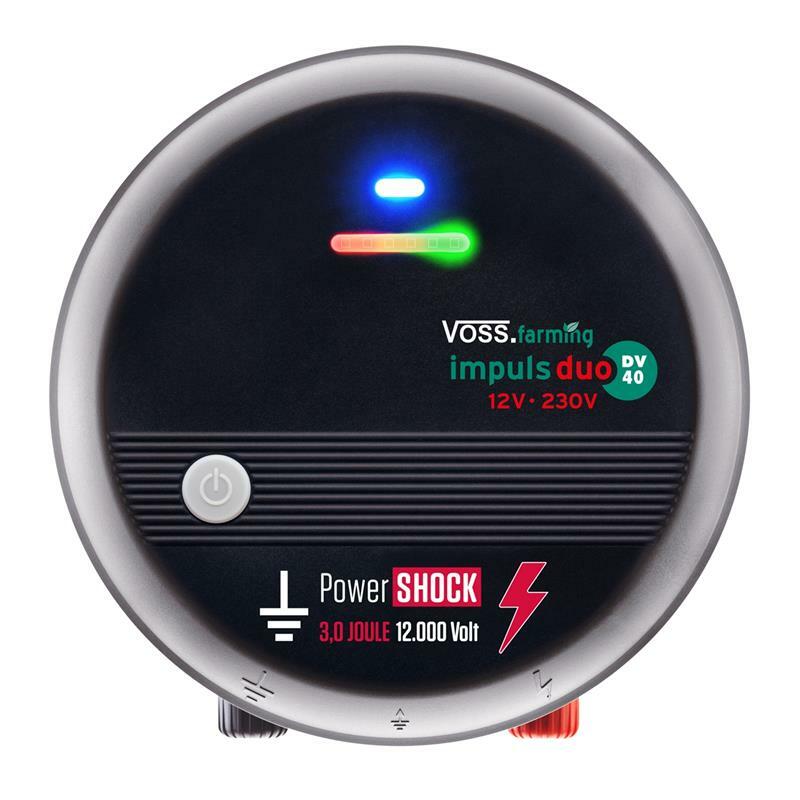 That's why we sell exclusively high-quality branded devices made in Germany – by VOSS.farming. 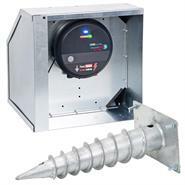 Naturally all our energisers fulfil the stringent European safety standard EN60335. Because we're convinced of the quality, reliability and safety or our devices, we're happy to offer you a 3-year warranty on all our energisers. And if you should still have any problems or questions, our professional workshop and our advice team will be happy to help you. This kit is particularly practical. 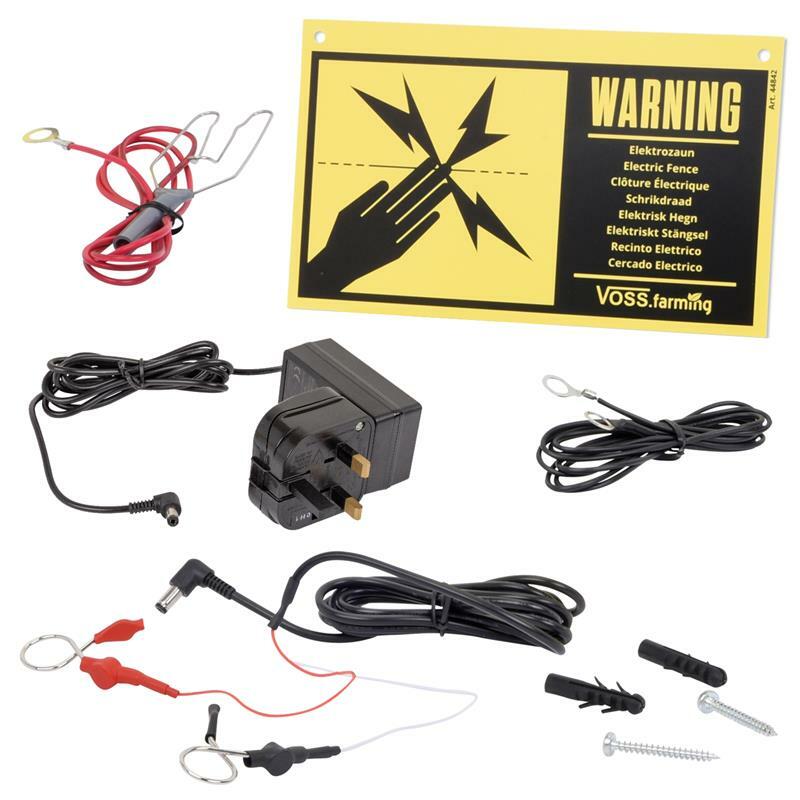 The VOSS.farming 12 V electric fence – complete kit offers you a powerful energiser which can be used for many different types of animals, such as poultry, goats, pigs, cattle, sheep, etc. 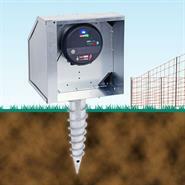 The "impuls DUO DV40" is suitable for medium fence lengths up to 15 km or for up to 9 electric nettings. The kit also includes a metal housing box to protect the energiser and a rechargeable battery (not included) from the weather. The anti-theft/grounding post is inserted in the ground and the metal box is mounted on top of it, making it difficult to pull the whole system out. A fence tester completes this set. A fence tester is a valuable helper, because if something is wrong with your fence, you will be able to recognise it quickly and act immediately – before any animals break out. 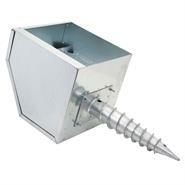 This balanced kit is your best preparation for a successful grazing season. Cheap set! 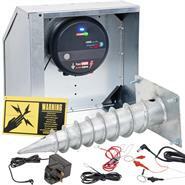 In addition, you can also use a car battery that lasts longer and can be recharged.